Don Thompson, McDonald's outgoing CEO. A broader sample shows an even more dismal diversity picture. 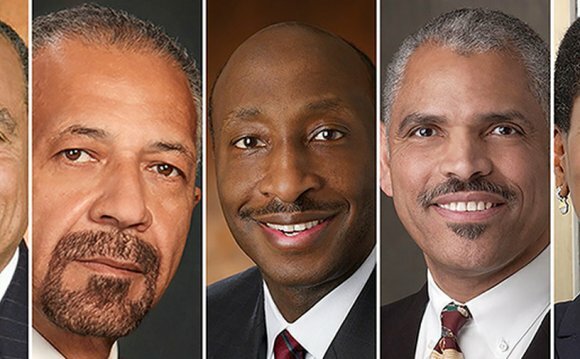 A mere five CEOs are black at the nation's 500 largest companies, according to a pro-diversity advocacy group. "Our numbers are going south on us, " said Ronald Parker, CEO of The Executive Leadership Council, an organization that works to boost diversity in corporate America. That's no better than two years ago when Thompson took the helm at McDonald's. He became the sixth African-American CEO in the Fortune 500. That number peaked in 2007 at seven, according to Richard Zweigenhaft, a Guilford College professor who wrote a book on the subject. The numbers are especially startling, given that 13.2% of the U.S. population is African American, according to the Census Bureau. Thompson's retirement leaves just five CEOs who are African-American in the Fortune 500. From left to right, Kenneth Chenault of American Express, Delphi's Rodney O'Neal, Merck's Kenneth Frazier, Carnival's Arnold W. Donald and Ursula Burns of Xerox. Corporate America's diversity problems are well-documented. Silicon Valley has been roundly criticized for being mainly white and male, and data show Wall Street hires mostly white and male bankers. Corporate boards, too, lack racial diversity and are overwhelmingly white. That needs to change, too, Parker said, and boards need to be "very, very intentional and methodical in succession planning." "They need to make sure that there are individuals (in the pipeline) who are getting the proper career experiences that will allow them to have the global perspective" to lead multinational companies, he said. Intel made a splash this month when it unveiled a five-year, $300 million diversity program to build a workforce that mirrors the level of diversity among tech graduates. CEO Brian Krzanich said the company is "missing opportunities" because its workforce doesn't represent the population. That's what Thompson has said. Shortly after his promotion, he said diversity not only boosts the company's bottom line, but "helps with the menu, too" by bringing new ideas to the table.